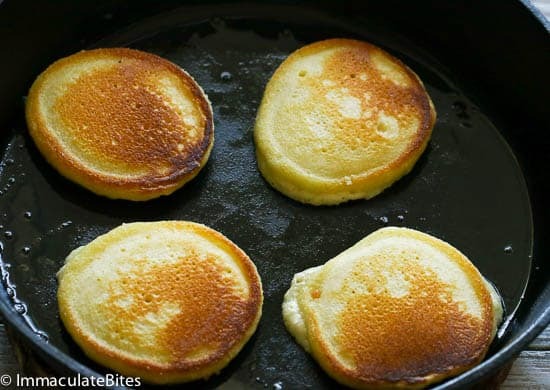 These Southern Johnny Cakes aka Hoe Cakes would be a great alternative to your everyday pancake – Made with cornmeal , with a touch of sugar and nutmeg – Light , Fluffy with a delicious crisp edge. 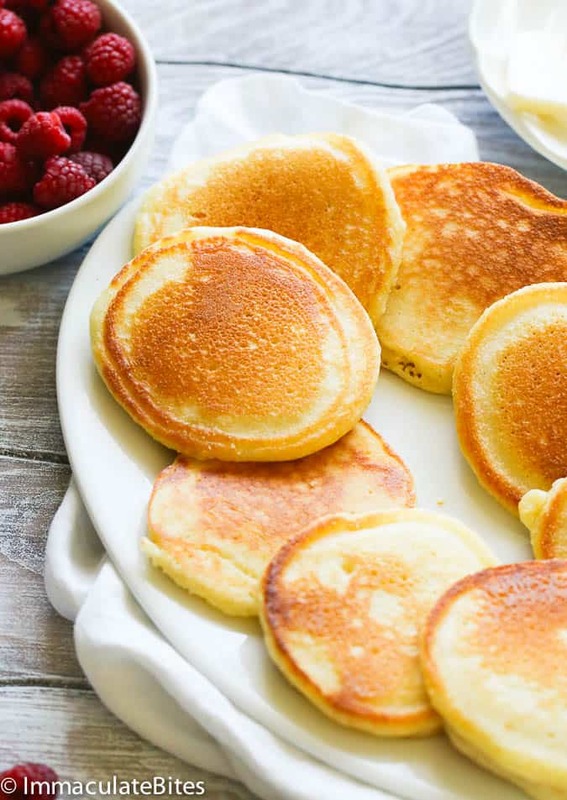 Hoecakes, are cornmeal flatbreads with exceptional texture and flavor. They are sort of a minimalist approach to cornbread. And for the most part is made without leavening agent to produce a flatbread that is delightfully dense and crisp at the edges with a lot to offer. 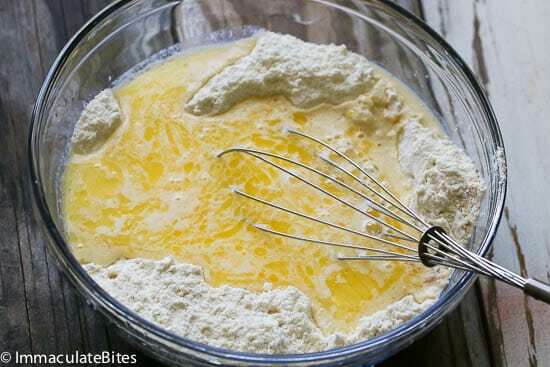 Aside from keeping the ingredients list simple, what you fry the cakes in matters. 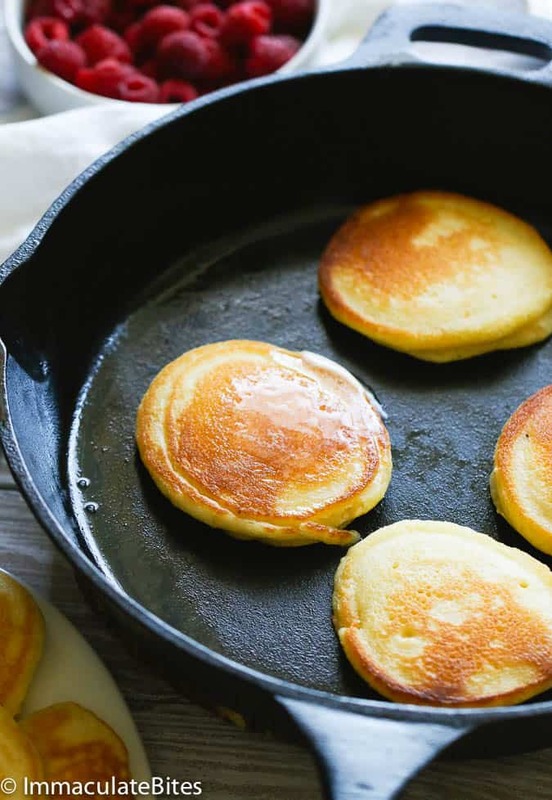 Along with the texture and subtly sweet flavor, hoecakes need some fat. It seeps into every inch as it fries for additional flavor. Butter or good ol’ bacon fat is the way to go. 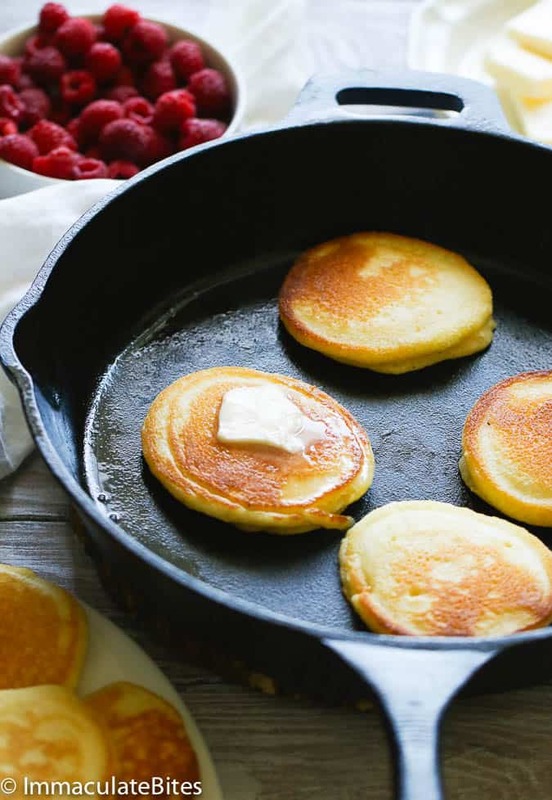 Butter will yield light, crispy hoecakes and promote that golden brown color only butter provides while bacon fat will add some of its signature pork and smokey flavor . For the health conscious go easy on the butter. leave out the nutmeg. Will still be friends. No worries ! Johnny cakes are a cinch. 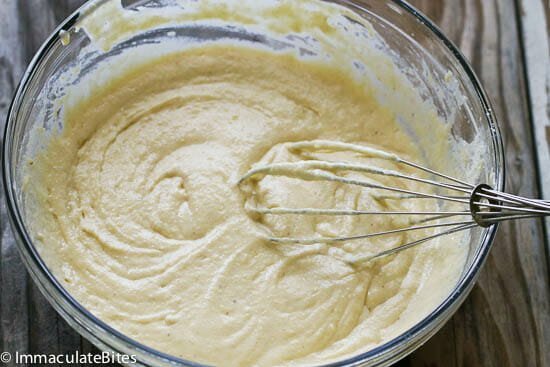 You mix the incredibly simple batter in a large bowl, heat your selected fat, spoon batter into the hot skillet and cook until golden and firm. Once done, serve them quickly because hoecakes are best when warm. Upon taking a bite, you’ll be greeted by their crisp and dense yet soft texture. As for flavor, the hint of fat is the first thing that hits your tongue followed by the expected corn flavor. The sweetness from the touch of sugar comes soon after and the nutmeg brings a faint hint of its signature aroma and complexity. Something special happens when the aromatic spice melds with sugar. 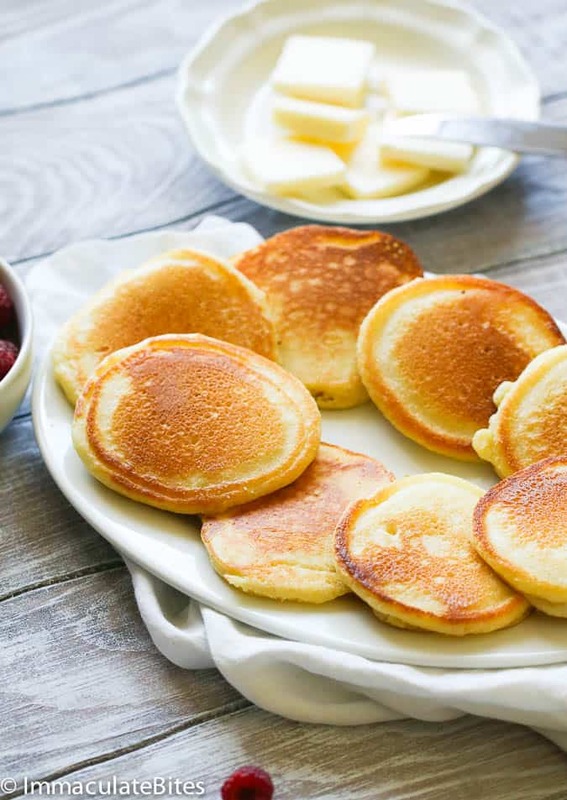 The duo enhances the hoecakes resulting in a perfect bite every time. Heat a lightly oiled cast iron or frying pan over medium high heat. Scoop about 2 tablespoons each of the batter onto the cast. 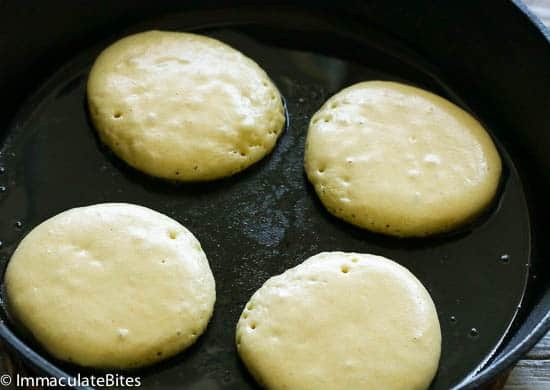 Fry each Johnny cake until brown and crisp; turn with a spatula, and then brown the other side. Remove and serve immediately with syrup and/or butter . I having been making sourdough coconut bakes for the last month and loving it. After reading your piece on hoe cakes, I have decided to try it. Because I am surrounding by coconuts trees here in Grenada, and I love adding freshly grated coconut to my baking instead of butter, I have decided to try your recipe with some coconut and a few Tbsp of my homemade sourdough. Will let you know how it turns out. Thanks for the recipe. used spelt flour to augment the nutty flavor of these cakes. will become a breakfast staple! 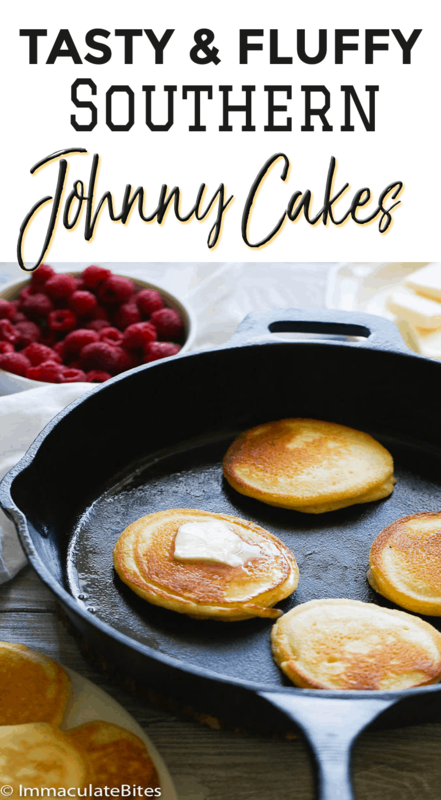 I would love to try the Johnny hoe cakes but with gluten free cornmeal.Do I need to make any other adjustments to the recipe? I have not tried this yet, but it sure sounds interesting. 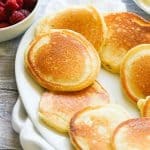 I am not a big fan of pancakes, but I LOVE LOVE cornbread, so I certainly expect to like these hoecakes. Will write bck when I try them. Thanks so much for sharing this with us! Yes, please. Can’t wait for you to try it. Enjoy! can this recipe be used for cornmeal style waffles – such as what Iron Rooster have on their menu? Hi, April! I haven’t tried it, but I don’t see why it won’t work. Please let me know how it turns out for you. I would increase the butter just like you do with regular pancakes. Sound marvelous. I think I’ll try that too. My mother used to make these years ago. But I think she used less cornmeal & more flour. Maybe something like 2/3 cupcornmeal. 1 1/3 cup flour. Very tast, especially with the addition of the nutmeg.for me,I did not use syrup, but my husband liked the syrup on them. Kinda of across between corn muffins & pancake. Thank you! Hi Pat, thanks for taking the time to share your thoughts with us . I came across your recipe and tried it while camping. Amazingly delicious! I drizzled sorghum syrup on mine which most people may not like, but they were great. And you’re correct, they good without anything on them. Awesome! So happy it worked out well for you. Thanks for that delicious Southern Johnny Cakes recipe. I tried it today for the first time and I really liked it. I like that you included those other ingredients. Great taste. Awesome Jo! Glad to hear it worked out well for you. Thanks for the feedback! I use buttermilk instead of whole or 2% milk. They taste much better and have more flavor. I use 1 and 1/2 cups of white fine ground corn meal. 2 table spoons of sugar. 1/2 teaspoon cinnamon. 1 and 1/2 cups of buttermilk. Mix all ingredients together and in a cast iron pan with hot oil or lard. Awesome! Thanks for sharing your version with us. Glad to hear it worked out well for you. Can I use maize meal instead of cornmeal? Thanks for the knowledge shared,I love it and will give it a try today.pls can I use cornflour in replace of cornmeal? Hi Temmy ! You sure can. Hi Rose! So glad to hear it brought back fond memories! Thank you for taking the time to share your thoughts with me. Thanks for the recipe! My mom calls them corncakes. I searched and searched for CornCake recipes and all I got was Cornbread like recipes. Then i found this (must be the southern name and Corn Cakes is the Northern Appalachian name). My mom said it was simple, just Cornmeal and milk… mine turned out horrible. I finally figured out she was using Cornmeal Mix, not plain Cornmeal. These sound so good! My childhood friend’s mother (from St. Croix) used to make us Johnny Cakes for dinner. I’ll try these tomorrow! They sure are tasty! Do let me know how it works out for you. Thanks! It’s just me this morning, so I halved the recipe and substituted glutten free AP flour. I left out the vanilla and nutmeg. They were great! Hi there, thanks a bunch for this. I was looking for something easy and quick…Having guest for bf. 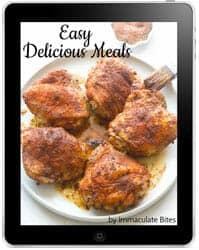 I would like to know where to get Immaculate bite cookbook. For a gluten free version, I would like to sub the 1 cup of ap flour with half (70 gr) maseca and half (70 gr) corn staech. They would taste a bit different, but 100% corn. Yum. And top them with coconut. Yum!!! OH YES! Me love coconut. I’ll tell you a shameful secret…I don’t like cornbread (at least the ones I have tried). 90% of the problem is that it is called bread but it’s a cake (you can’t fool me on this, it’a a savory cake and it sure is not a focaccia). It’s a mental thing I guess. But these hoe cakes might replace cornbread well and they are called ‘cakes’ so no wrong advertising XD. I feel like using lard these days so that’s what I would use to fry them (lard is amazing and one of the healthiest oils to fry with, much more than peanut or sunflower ~ of course frying is not that healthy to begin with…but really, it’s excellent). Can also make them gluten free using corn flour or 1 to 1 gf flour!!!! We live on these! Easy and inexpensive!!! Awesome! !Thanks for taking the time to share Christine. Thanx…..will definitely try dis. Please do u mind sharing your cornbread recipe as I have bin wanting to mk cornbread but can’t get hold of d recipe, I will really appreciate. And please is cornmeal same as cornflour coz its cornflour I have. What happened to the cane syrup or molasses that I grew up eating with the hoe cakes. Using these two instead of honey or maple syrup will really be authentic! That would be great too! Thanks for sharing!!! How much salt, no mention in ingredients, just in directions. No mention of the water in the directions, just in ingredients. Thank you. I winged it and they turned out pretty good! No need for syrup at all. Thanks for this recipe. 🙂 Love the crunch! NO WAY!!! That was fast. I agree no need for syrup but my son can’t have it without. Thanks for trying it out Darlene. Glad it worked out well for you. Recipe has been updated. Thanks for this! It seems an interesting variation of what the English know as the Flap Jack. Looking forward to giving these a try.